This streak free water based cleanser removes fingerprints, food residue, greasy grime and much more from multiple surfaces including: varnished wood furniture, glass, vinyl and mirrors. Prevents splotching on Cherry wood, Maple wood and Walnut wood. By simply maintaining the luster of your furniture, you are ensuring it's heirloom quality to last for generations to come. 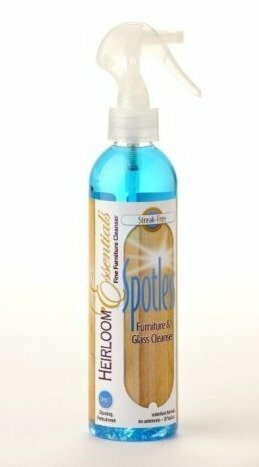 Heirloom Essentials Spotless Cleansing Pretreatment Furniture Polish contains NO silicone and NO wax. Spotless Cleansing Pretreatment is a revolutionary water-based furniture cleanser. Its unique streak-free formulation makes it possible to clean varnished wood furniture, glass, mirrors and many other hard surfaces quickly and easily. Cleans and removes fingerprints, food residue and greasy grime. Spotless can be used alone or clean with Spotless prior to polishing with Heirloom Essentials Fine Furniture Polish for an unbeatable shine! Enhances luster consistency and controls splotching on cherry, walnut and maple wood furniture. Cleaning and maintaining with Heirloom Essentials will extend the life and beauty of your furniture and cabinetry. For best results use with Woodwright Heirloom Furniture Polish. I bought an Amish made table and chairs and this product was recommended.